RWBY Volume 3 is where it gets real. Like, really real, fo' reals. RWBY is a Rooster Teeth original animation created by the late Monty Oum that focuses on the lives of young hunters-in-training as they mature in to their roles of protecting the world from the major threat known as Grimm. It’s clearly inspired, and is stated as such by Kerry Shawcross and Miles Luna, by the anime style. Whether or not it’s “real anime” isn’t a conversation I really care much about. What I DO care about, however, is just how incredibly well-paced, animated and just generally put together RWBY Volume 3 is. It’s come a long way since the original episodes and the story tore me apart this time around. If you like anime-style action, imaginative character and weapon designs as well as great stories that aren’t afraid to take risks, RWBY Volume 3 can do almost no wrong. Read on for our full RWBY Volume 3 review! Let’s get the stats out of the way first: RWBY Volume 3 contains 12 episodes of the show at a full run-time of 02:56:55. It features the option to watch it as a whole or watch it in chapters from the main menu. It also houses several impressive Extras housing interviews with the producers, writers, voice actors giving insight in to what makes RWBY special to those that make it. In the Setup, we can turn on a Director Commentary, Cast Commentary, Crew Commentary and Subtitles (naturally). Finally, we have trailers of other Rooster Teeth properties such as Lazer Team, RTAA, RVB Season 13, Crunch Time, Immersion and the video game RWBY: Grimm Eclipse. All in all, a pretty stacked volume of content. I’d argue that the animation in RWBY as a whole is an acquired taste. Initially jarred by the 3D animation in Volume 1, I’ve grown accustomed to and appreciative of it (think Knights of Sidonia style, if you’ve not seen RWBY. Look it up if you haven’t seen either. You have access to Google. It’s right there). The anime-in-3D style allows for some beautiful choreography in the fight scenes that’d be far more difficult to pull off in the 2D space. I do think that, at times, this leads to a lack of expressiveness in the facial animations, but as the team is improving by leaps and bounds with each volume so I’m sure this will eventually fall by the way side. Above that have always been the character designs. They’re distinct, striking and memorable. Not just in regards to the four main heroines, but the many side characters and we’re introduced to an even greater variety in this volume. My favourite, by far, has to be Team Funky. From a visual stand-point, the musical score that accompanies the fight and their initial insults eventually warming to Yang and Weiss. The presentation around their colourful fight is just superb. So outside of the same facial animation issue I’ve had with the series in the past, and even that’s honestly not a massive deal, the show just keeps improving with every new release in every aspect. The soundtrack sets the tone so well throughout, most notably the solemn piano rendition of the main theme at the most emotional moments of the volume, and there are a fair few. 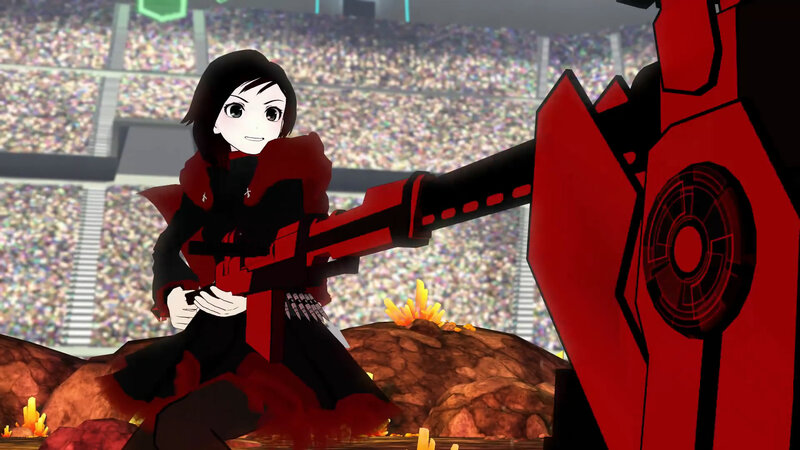 The biggest feature of RWBY is the transformable weapons each character wields. Each weapon is usually a combination of two or more different styles, such as Ruby’s scythe-rifle, and they’re all pretty awesome. In one of the early fights we see a hover-board that breaks apart and can absorb different elemental crystals to alter its attacks. It’s always great to see these, though I felt some of the more accomplished hunters that were introduced had less impressive weaponry than expected, outside of Qrow’s Gear Edge (that’s right! I’m making a name up for it), which turns his otherwise standard gun-blade looking sword in to a versatile weapon that splits in to segments. We don’t get to see it much, but that first fight showcased it well enough. All in all, I can see the improvements of RWBY clear as day in this volume and I look forward to more advances in future volumes as I don’t see them stopping soon. 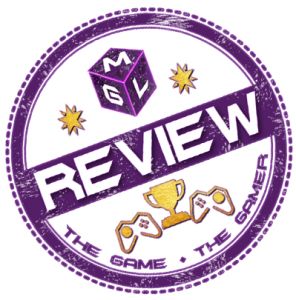 It needs to be stated that SPOILERS WILL FOLLOW FOR THE SAKE OF AN IN-DEPTH REVIEW. If you’ve yet to watch RWBY Volume 3, I advise that you do so or skip this section if you have any interest in it. So a season that began with a bit of seemingly friendly competition resulted in tragedies all-round and secrets revealed. All of this in service of expanding the world of RWBY in the eyes of the audience. The world is bigger than Beacon, and this is where we see the cracks in their otherwise mostly untroubled bubble. We’re reintroduced to RWBY with the same degree of levity I’d expect to see from an RT product, with team RWBY (Ruby, Weiss, Blake and Yang) winning their Vytal Festival 4 on 4 match and enjoying the festivities on the whole. In fact, the 4 v 4 matches resulted in the funniest moment of the entire series for me when team JNPR are arguing about team-attack names. Upon being interrupted, Jaune Arc’s response cracked me up. This volume brings in the big guns. In a similar way to the elder Hunters of “Hunter X Hunter” turning up and displaying a level of skill the children of this world have yet to achieve, so too does this occur between Ruby’s uncle Qrow and Weiss’ sister Winter, in a heated clash that ends only at the insistence of Winter’s boss: James Ironwood, General of Atlas; the military nation. It turns out, these high-ranking Huntsmen have gathered due to an attack on an important figure indicating that a terrible power is on the move. As the volume progresses, it gets significantly darker, heavier and important. The Vytal Festival bouts are being manipulated by Cinder; a mysterious young woman dealing primarily in the wielding of fire. In creating a chaotic environment within Beacon, she hopes to draw the Grimm – monsters attracted by negative emotions – to absorb the last of the power she failed to drain from the Fall Maiden in her first attempt. Her motivation is cloudy at best, but in the positive sense. We know she’s doing this under the order of somebody else (and we get a brief glimpse at the end) but we know nothing of her ultimate goal. Meanwhile, Ospen – head of Beacon Academy – meets with Qrow and Ironwood in his office to discuss the current situation and address the issue of the Maiden’s attack. Using new Atlas technology, they believe they’ve found a way to transfer the dying Fall Maiden’s powers to another, but perhaps their consciousness too, which may over-write the original personality of the receiver. It’s an unknown, but somebody (Cinder, unbeknownst to the leaders gathered at Beacon) has already stolen some of her power before Qrow intervened and they need to transfer the remaining amount to a trustworthy and powerful body. A new Maiden must be forcibly made. Pyrrha Nikos is chosen and takes her time to decide. Knowing she might lose the new-found valuable connections she’s made with her Beacon friends, including the romance between herself and Jaune, she has a difficult decision to make. Meanwhile, Blake is faced with an old flame that proceeds to chop off Yang’s arm in an effort to break Blake’s spirit. 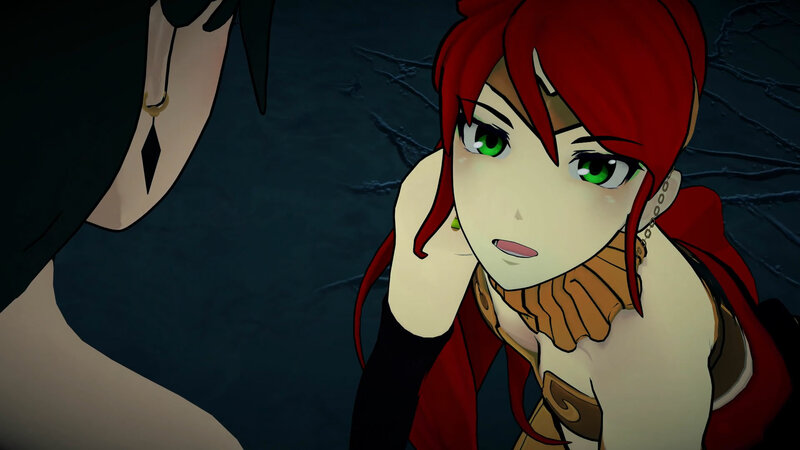 Pyrrha is tricked in to killing Penny during their one-on-one match via Emerald’s ability to alter senses, revealing her to be an android developed by Atlas and sending the people in to panic. 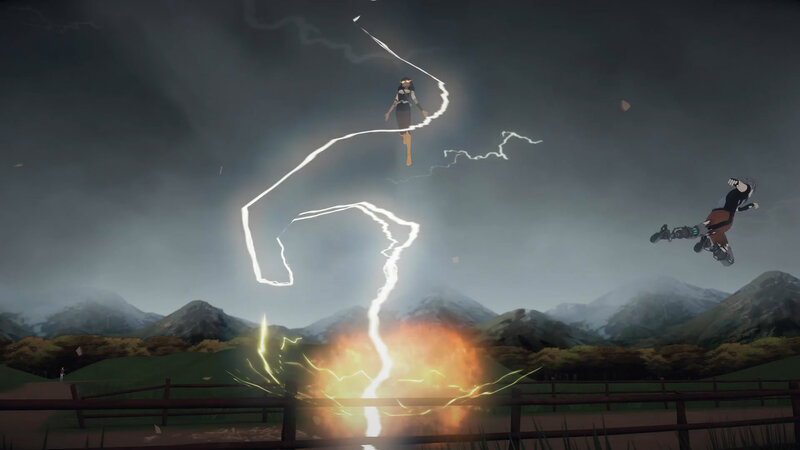 RWBY unleashes an unbelievable power as she watches Cinder burn Pyrrha to ash, but Beacon has already fallen. Ozpin is nowhere to be found in the aftermath of his own battle with Cinder. There’s just so much going on here, and you can feel that it’s the end of the peaceful era for Ruby and friends, as Qrow tells Ruby of her silver eyes and what they mean in a very vague manner after the events of Beacon’s destruction. We leave off some time after, with Ruby, Jaune, Nora and Ren head out to find those responsible for the invasion of Beacon. Yang, still devastated by the loss of her arm, falls in to a pit of depression. Blake returns to her life alone, seemingly because having warmed to her friends is what led to Yang losing her arm. Weiss has been retrieved by her father as the events of Beacon were broadcast to the entire world of Remnant by Cinder and portrayed as a failing of the current leadership. Keeping it at 12 episodes, RWBY has always had great pacing, but this season it manages to pack in all of the emotional punch that usually comes within a few full seasons of the average, long-running anime. I felt thoroughly invested in the fall of Beacon and couldn’t believe my eyes when Cinder actually succeeded and took out Pyrrha. It all seemed as if Ruby would make it just in time, but she didn’t. To have this occur after only just losing Penny, whom she’d found a kindred spirit in, led to Ruby revealing her potential, but it was too late. All of the character arcs progressed in a meaningful way and the deaths that occurred did so with purpose. I can’t fault the plot of RWBY Volume 3 at all. I absolutely adored it all the way through. This edition of Ruby has English voice acting, as a Rooster Teeth production based in Texas this makes sense, and features some good work from notable employees of the company. It’s not the greatest dub by any stretch of the imagination, but standouts are Miles Luna as Jaune and Lindsay Jones as Ruby. Along with Samantha Ireland as Nora, these three characters in particular have either a great range of emotions (Jaune transitions between extremely goofy to meaningful a fair amount and Miles does it justice) or excel in one particular point (Nora’s excitable nature is always on-point to me via Samantha’s performance). In this particular series, RWBY brought in notable professional VA’s for a few roles. I feel Yuri Lowenthal as Mercury Black may have been a little under-utilised, but Vic Mignogna does a fantastic job with the “he’s always drunk” Qrow Branwen. I like Jessica Nigri too, but the performance of Cinder felt comparatively weak in among some of the more standout performances. It may not have helped that Cinder doesn’t do a great amount of talking – her actions are what make her stand out. Garrett Hunter’s Adam Taurus also lacked a bit of the gravitas I’d expect from a leader of the White Fang revolutionary group. Nevertheless, it’s peaks and valleys with the dub of this show and the good far outweighs the less-good. No particularly bad performances at all. An arena’s worth of extras! 3, 2, 1, Begin! 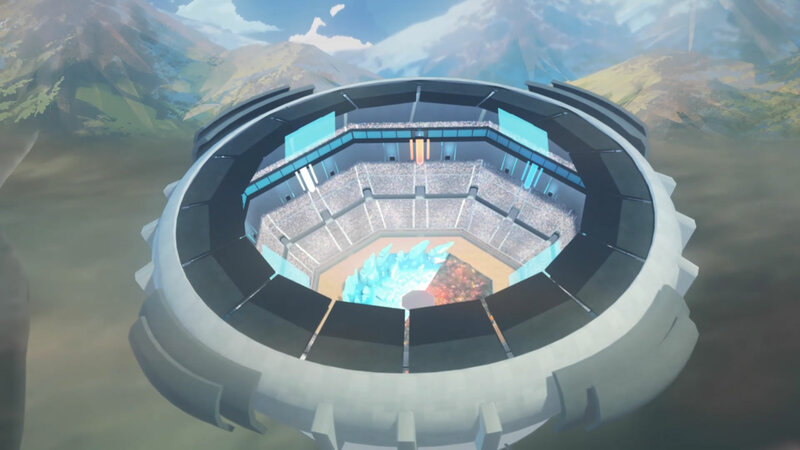 – the directors, writers and various other members of the RWBY team discuss their favourite parts about the Vytal Festival. No Heroes In The End – the people behind RWBY talk about the journey of this particular volume and how they wanted these characters to really take the gut punch this time around. Let’s Make A Show: The Legacy of RWBY – the team looks back on the reception to RWBY, the conception from Monty Oum (RIP) and hint to how much they have planned. CRWBY Photos – photos of the crew behind RWBY…. did you not get that from the name? RWBY Volume 3 Trailer – self explanatory. Not self exploratory. World of Remnant – a 14 minute (and some change) look at the RWBY’s world and its history. These features were highly enjoyable, but I may be biased as I’m a fan of Rooster Teeth’s work in general. Nevertheless, your average release doesn’t often contain this much in the form of extra content. I feel you Ruby. It’s deep. RWBY Volume 3 improves on its previous volumes in every conceivable way and firmly cements RWBY as a legitimate series that isn’t afraid to take risks with the characters we’ve come to care for. It’s beautiful, unique and devastating all at the same time. With only minor nit-picks to make in the form of the occasional facial animation and voice acting performance, I’m excited to see what happens next in the world of Remnant as we’re about to embark on a much grander journey. Add to that the extras they’ve packed in, the several commentary tracks and ample amount of trailers and you’ve got yourself a pretty great package. 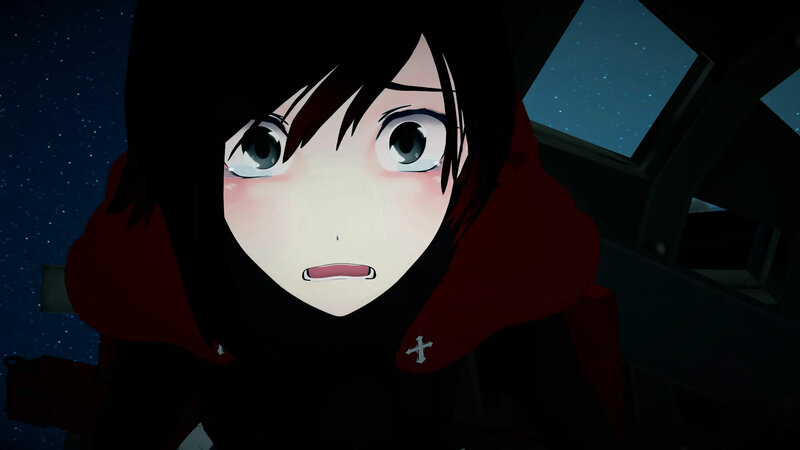 It’s hard to fault RWBY Volume 3 as a whole, and I don’t intend to try any further. If you’ve yet to become enthralled with RWBY, now is most certainly the time.